The Green Bay Packers 2017 season was an emphatic reminder on the importance of Aaron Rodgers. After a strong 4-1 start, the Packers lost Rodgers to a broken collarbone in Week 6 against Minnesota and subsequently saw their season spiral out of control. Green Bay limped to a 3-8 record the rest of the way, finishing at 7-9 to miss the playoffs for the first time since 2008. Rodgers will be back under center this season as the Packers strive to reclaim their place amongst the NFC powers. With Rodgers at the helm, the Packers offense will hope to transform back into a unit that strikes fear into opposing defenses. Look no further than PFF’s team offensive rankings to see the impact of Rodgers – Green Bay had PFF’s 18th–ranked offense without Rodgers in 2017, compared to PFF’s third-ranked offense with Rodgers in 2016. His 2016 season sheds light on just how important, and dominant he can be. In 2016, Rodgers had an elite 92.2 overall PFF grade, ranking third among all quarterbacks. Rodgers led the league with 40 passing touchdowns and ranked fourth with 4,428 passing yards. He was the league’s best quarterback under pressure with a 93.8 passer rating (64.6 NFL average) and 12 touchdowns. Rodgers was equally impressive when kept clean from pressure, ranking seventh with a 107.7 passer rating (99.3 NFL average) and third with 28 touchdowns. An overlooked addition to Green Bay this offseason is Joe Philbin, the former offensive coordinator that left after the 2011 Super Bowl to become the head coach of the Miami Dolphins. Rodgers has lauded Philbin’s influence in his play on many occasions, and in Philbin’s final year as Packers offensive coordinator, Rodgers recorded a 99.0 overall PFF grade, the highest mark PFF has ever seen from a quarterback. Can Rodgers and Philbin recapture some of that Super Bowl-winning magic? While the return of Rodgers cannot be understated, perhaps even more critical to Green Bay’s future are the sweeping front office, coaching and roster changes that followed last season’s failures. How the Packers respond to an organizational revamp is another compelling storyline as Green Bay enters training camp. The Packers employ a trio of disparate players to form one of the deepest stables of running backs in the NFL. The early-down bruiser is Jamaal Williams, a 6-foot, 213-pound battering ram that consistently churns out quality yardage (69.8 overall PFF grade, eighth among rookie RBs). The primary passing-down back is Ty Montgomery, a converted wide receiver, who broke out in 2016, leading all running backs with 5.14 yards after contact per attempt (minimum 20 touches), but failed to live up to expectations as he battled injuries all last season and shuffled in-and-out of the lineup. Aaron Jones will return from suspension in Week 3 and could end up being the best of the bunch. Jones is a game-changing back and had runs of 15-plus yards on 9.9 percent of his rushing attempts last season, trailing only Alvin Kamara among all running backs. The unquestioned leader of the Packers wide receiving corps is Davante Adams, PFF’s 12th-highest graded receiver last season with an 83.5 overall grade. Even with the struggling Brett Hundley under center, Adams did not miss a beat and he was rewarded handsomely with a $58-million extension. Last season, Adams generated a 120.3 passer rating on all his targets (eighth among receivers), with that number spiking to 129.0 in the red zone (second among receivers with at least 10 targets). Every offseason, players and fans alike must be reminded that the NFL can be a cruel business, and this reality hit hard when the Packers released Jordy Nelson. The 33-year-old wide receiver struggled last season without Rodgers, generating a 72.6 passer rating on all his targets (78th) to mark a precipitous drop from the 122.4 passer rating (fifth) he produced just one season ago. Jimmy Graham was the big-ticket free agent signing this offseason and his presence will provide Rodgers with a dynamic weapon to replace Nelson. Graham is particularly potent in the red zone as last season he led all pass-catchers with 27 targets, four more than the next closest player, and 10 touchdowns. 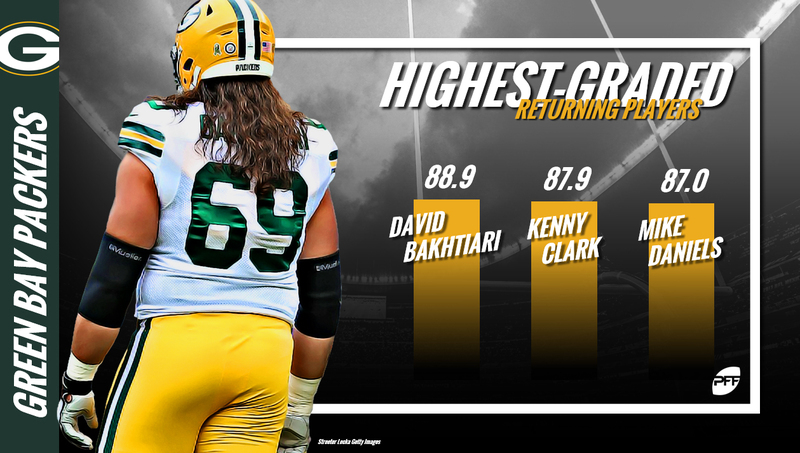 The Packers are hoping that Graham’s 54.2 overall PFF grade last season was an aberration and that he can rebound to his 2016 form where he ranked fourth among all tight ends with an 86.5 overall PFF grade. Randall Cobb operates out of the slot and while he too slumped last year, as recent as 2016, Cobb was PFF’s 18th-ranked wide receiver with an 83.2 overall grade. The Packers brought in several impact defenders to upgrade their secondary as Tramon Williams makes a triumphant return to the Green Bay organization after a resurgence in Arizona, where he ranked ninth among all cornerbacks with an 88.8 overall PFF grade last season. Green Bay used their 2017 first-round pick to select Jaire Alexander, a cornerback out of Louisville that allowed a measly 19.9 passer rating on throws into his coverage last season, and then doubled down on corners by using their second-round pick on Josh Jackson, who was PFF’s highest graded FBS cornerback last season with a 96.0 overall PFF grade. Additionally, the Packers will be counting on improvements from second-year players Kevin King and Josh Jones, both of whom will likely be in starting roles this season. Though King dealt with shoulder woes all last season, he looked like a stud in the making after a stellar performance covering Julio Jones in Week 2 where he recorded an 85.4 PFF game grade, ranking seventh among all cornerbacks that week. The Packers do hold one of the league’s top units, entering 2018 as the top ranked run defense entering. With stalwarts like Blake Martinez (89.7 run defense grade, eighth among linebackers), Kenny Clark (88.6) and Mike Daniels (88.1), running on the Packers defense will be a daunting task. Though last season was undoubtedly frustrating, the Packers are primed for a major bounce back. In fact, last year’s struggles accentuated various roster weaknesses and induced solutions. Compound the return of a difference maker like Rodgers with vital roster improvements, and there is substantial reason for optimism surrounding the Packers. The Vikings present a formidable challenge atop the NFC North, will Rodgers and company be up to the task?